How did you arrive at EarthCorps? I never would have described myself as outdoorsy or athletic prior to arriving at EarthCorps. My family didn’t go camping or hiking. We never had much money so I never went skiing or snowboarding. Despite having never done any of those things, I was always drawn to them. I would look at pictures in magazines and wonder, ‘Will I ever be in any of those places?’. 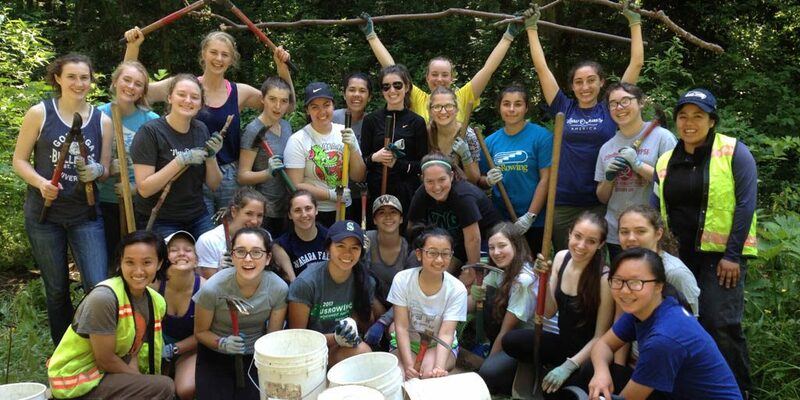 So when I discovered EarthCorps and thought about going to Seattle to do restoration work, I thought, ‘Maybe this is finally my chance to live the life that I had always imagined myself living.’ It worked out. I had never been out here before, but I thought I would try, and I ended up really loving it. EarthCorps provided me that opportunity. Before my Corps year, I didn’t understand that I could work to alleviate environmental stress on my surroundings. I never understood the concept of things that might be invasive and why those things might be harmful to a natural ecosystem. I just assumed that things grow, and it’s a battle of the fittest. During my corps year, I came to understand that if something is introduced into the environment by people, those things can have unintended consequences that harm both the planet and its living plants and animals. Everything that’s connected to the natural systems that sustain all life forms is affected in unexpected ways. What made you hopeful about the work? Obviously, it seems like a losing battle. No matter what, there will always be a need for EarthCorps. The pace at which some of these invasive plants grow, there’s no way that we can outpace them, so all we can hope is to mitigate or alleviate the harm that they cause. But as to hope, I think there are two answers to that. 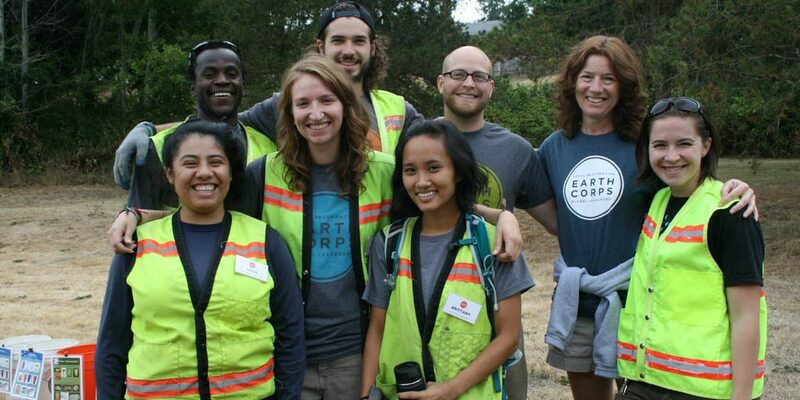 During our Corps year, EarthCorps brings in international members. It was really inspiring to see folks from other places around the world who were also similarly concerned with protection of the environment and their public lands and really eager to learn from one other about how other places and other people combat environmental destruction. It isn’t just a Western concern. People all over the world care about their surroundings. Sometimes it seems like the perception here is that people of color don’t have interest in the outdoors and their natural environment and I think that meeting people from all over the world can really debunk that perception. 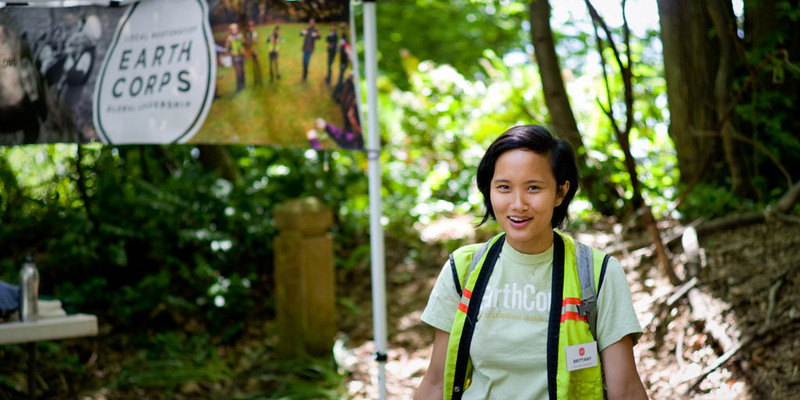 During my second year at EarthCorps, I led volunteer events across Seattle. You meet a lot of folks when leading crews: older folks, younger folks, students, or random community members. It was really fun to see all sorts of people come out. At the beginning of the day, they would be very shy with each other and there would be a hesitance to engage, but over the course of just four hours, they would accomplish a lot of work and form connections with other people as well as with the work that they’re doing. I think that’s really important. Protecting the the environment and caring about your surroundings comes first from building connections with other people while they’re in those spaces. Creating positive and powerful memories of the outdoors fosters a care for the outdoors. I appreciate that EarthCorps gives folks of all backgrounds opportunities to be involved in this kind of work. I didn’t have the kind of experience that I thought would seem valuable on paper, but through the interview process, the folks that I spoke with decided that they saw something in me worth pursuing. When I was hired, the person that offered me the position said that I was a ‘wildcard.’’ Despite the fact that I had very little experience working or being in the outdoors, EarthCorps saw a spark of something in me that made them feel confident enough to give me a chance. So the only reason why I’m out here is because somebody gave me an opportunity. Somebody saw something in me aside from what I had on paper, and I think that’s really important. Being outside and recreating outside is a privilege for many folks. I thought lack of access to the outdoors would be a detriment to my ability to get a job at EarthCorps. But I think EarthCorps’ hiring process proves that no matter what your level of experience is, everyone can learn to be a leader outdoors. The environmental non-profit realm is largely a white movement. For instance, if you look at EarthCorps’ structure, it’s comprised mostly by white staff members, and the non-international corps members are also mostly white. My experience at Washington Trails Association, which is where I work now, is very similar. Environmentalism and environmental protection can’t exist within a bubble. If we want to really create a new generation of environmental stewards, all voices need to be involved and valued and all perspectives have to be considered. If this movement either intentionally or unintentionally exploits or excludes the perspectives and voices of the people who are most likely to be immediately affected by environmental degradation, we would be silencing an entire chunk of the population that could otherwise be fighting and advocating for the protection and restoration of our public lands. have better allowed you to be successful? One thing that has been really important is more confidence in my physical ability. I never would have considered myself an athlete growing up. I’m really surprised that I was motivated enough to finish my first year. It was a really grueling experience. Knowing that I can push myself beyond what I ever thought I could is really important. I had never tried to push that edge before, but when I finally did, I realized I could push it even further. self, what would you say? I encourage you to really immerse yourself in every single moment and aspect of this experience over the next two years because they will impact you in ways that you could have never expected and when the two years are done with, you will walk away with a greater understanding of yourself, other people and your ability to make a tangible impact. Hold onto those moments and those memories and those people, because they’re going to mean a lot to you. Everyone I knew at EarthCorps has dispersed across the world, and maybe I’ll never see some of them ever again, but I think it’s really beautiful that these experiences provided that opportunity to connect with people all around the world for at least one moment, regardless of wherever we all might go.